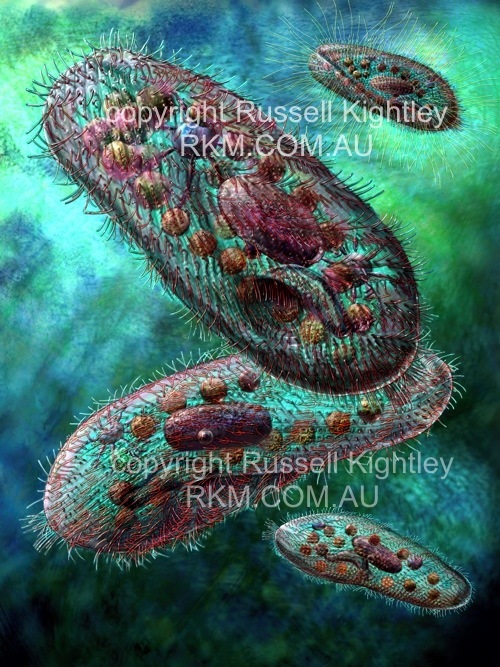 Image (Artwork) of Paramecium. This image is 500 pixels across, the original image is 4200 x 5601 pixels and lacks all labels. EXPLANATION OF PARAMECIUM IMAGE: The picture includes four images of Paramecium from different viewpoints. Paramecium has a rather complex shape with a slight helical twist and a ventral "mouth". It is a single cell and is covered in a firm pellicle from which many cilia project. The cilia act like tiny oars and propel the paramecium along and drive food into its "mouth". The food (mainly bacteria) progresses along the gullet (bluish, slightly "S" shaped feature) where it collects at the end in a newly forming food vacuole. This eventually buds off from the gullet. Food vacuoles circulate around the interior of the paramecium and finally dock with a fixed hole and the rear ventral surface where the undigested material is ejected. Paramecium has characteristic stellate contractile vacuoles fixed dorsally at front and rear which remove excess water. Available as a poster from BioCam.